On Rick's show last Friday. Some context here. The original letter I co-signed is here, and the debate that followed was posted by Bill Black here. 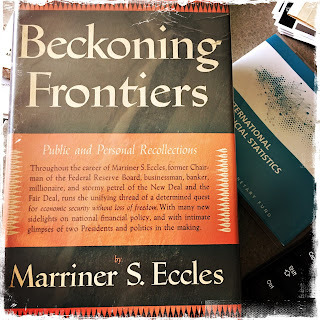 There are many issues I take exception with the piece at the Deseret News on the new Marriner S. Eccles Marriner S. Eccles Institute for Economics and Quantitative Analysis at the University of Utah’s David Eccles School of Business. In the first place, the notion that it, somehow, “will provide some philosophical balance to the university’s educational offerings and scholarship on economics.” Not just because there is no need for more balance. Everybody in the David Eccles School is mainstream, neoclassical (so no balance there), and a good chunk of the Econ Dept (yep, basically there are two Econ. Depts at the U, which shouldn’t surprise anybody; NYU has a very neoclassical and conservative one with Thomas Sargent in the Liberal Arts/Social Sciences division, and another with Dr. Doom, Nouriel Roubini, at the Stern School of Business) also is neoclassical. The department was always pluralistic. Actually, the balance in the education is brought by the fact that there are still a few heterodox economists in the Social Sciences Econ Dept., not including the two retired professors cited in the piece. And given the failure of the profession (in particular after the Great Recession) and the fact that a few at the Dept, when I was there btw, where aware of the bubble and the crisis (I remember getting emails from students saying that I had called the crisis; I didn’t per se, but was connected with many people that did and many like Jamie Galbraith or Jane D’Arista visited and taught at the U because of its diversity). How in hell you square that philosophy, which is quintessentially the one of the New Deal, with a center funded by the Koch brothers’ libertarian, minimal state philosophy is hard to understand. 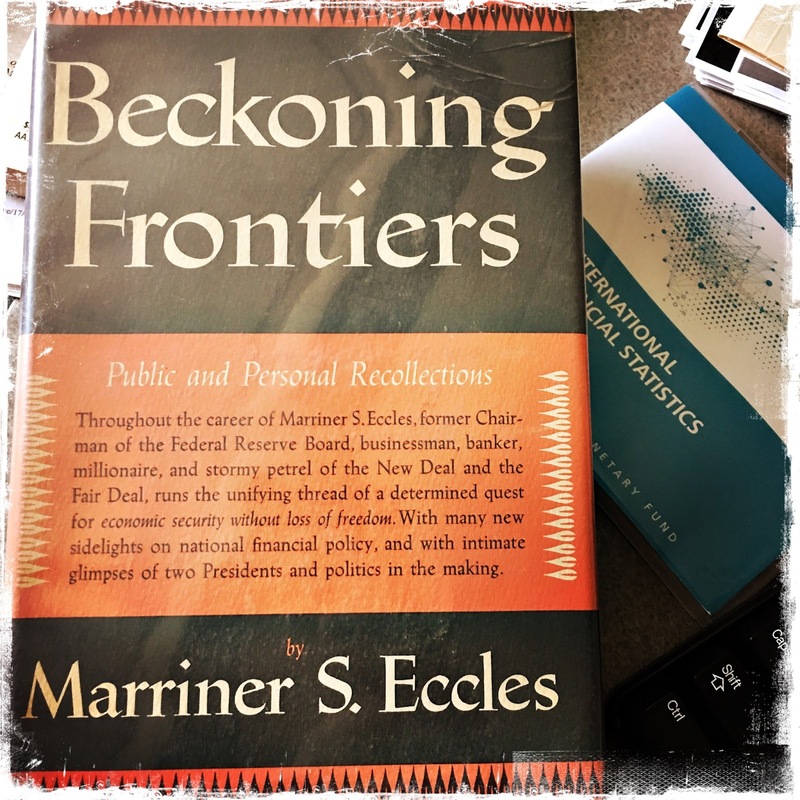 On Eccles read my old paper in the working paper series (later published in this volume) of the U’s Econ Dept. 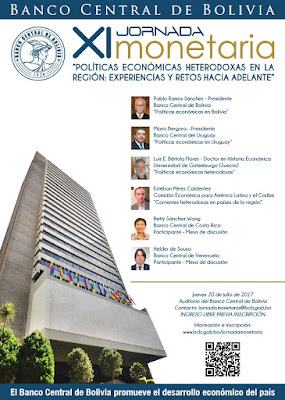 Esteban Pérez Caldentey will be talking about the topic in the next conference of the central bank of Bolivia. Program, that includes also Luis Bértola speaking on heterodox (presumably the unconventional, but not heterodox as in not mainstream inspired) monetary policy, is available here. The paper is a contribution to a long-run theory of effective demand with elements from monetary circuit theory, Modern Monetary Theory and endogenous finance analysis. Some shortcomings of the still influential neo-Kaleckian growth model and monetary circuit theory are underlined, and the Sraffian supermultiplier is indicated as the most promising heterodox approach to growth and instability in capitalism. The Sraffian supermultiplier allows full consideration of the autonomous components of aggregate demand as the ultimate sources of growth and instability in modern capitalism. Following Steindl, capital gains are included among these components. Autonomous demand and investment are typically fed by endogenous finance. The paper articulates the relation between autonomous demand and investment on one hand, and endogenous finance on the other, in the light of Keynes’s distinction between initial and final finance. From Vulture Funds to 100-year bonds: Has Argentina Turned Around? Just a couple of years ago Argentina’s left of center government was besieged by foreign investors, the hedge funds known as Vulture Funds, that demanded full payment for their bonds acquired at heavily discounted prices in the secondary markets. The New York courts ruled in favor of the Vulture Funds, and Argentina was unable to borrow in international markets, even though during the successive governments of the late Néstor Kirchner and her wife Cristina Fernández de Kirchner the country had successfully renegotiated its debts with 93 percent of the bondholders, and the economy had recovered from the worst crisis in its history, growing at fast pace while diminishing inequality. In November 2015, the left of center candidate associated to the Kirchners lost a close election to the center-right, neoliberal ex-mayor of Buenos Aires. Mauricio Macri, the new president, the heir to a private fortune amassed mostly during the last and bloody dictatorship and the ex-president of Boca Juniors, the most popular football team in Argentina, had promised reforms to reignite growth, that stalled in the last few years of Cristina Fernández’s administration, alongside with the slowdown of the global economy, and a collapse of the prices of commodities like soybeans, Argentina’s main export resource. Macri’s administration devalued the peso, even though he had promised he would not do it during the campaign, promoted fiscal adjustment, eliminated export taxes that had been imposed by the Kirchners that affected the wealthy, and agribusiness interests in the country, and increased tariffs of public services, that were seen as distorting the functioning of markets. These market-friendly policies, were seen as the basis not only of a renewed process of growth, but also the fundamentals for establishing price stability. Yet, the economy stagnated and inflation run out of control. The reasons are simple. A devaluation is generally both contractionary and inflationary, since a devaluation increases the prices of imported goods, directly affecting prices, and also, by increasing the cost of living it leads to a reduction in real wages. 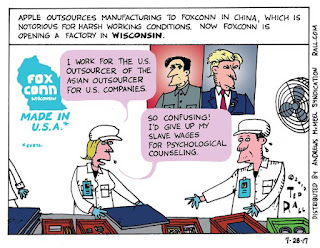 Lower wages, in turn, translate into lower consumption, and reduce demand, which leads to a recession. The increases in tariffs deepened the inflationary pressures, while the recession, which implies lower income and a reduction in tax revenue, together with the reduction in export taxes, lead to a worsening of the fiscal accounts. All of that was expected, including by Macri’s government. In fact, higher inflation that reduced real wages, and higher unemployment that weakened trade unions were central to the economic plans of Macri’s administration, as much as renegotiation with the Vulture Funds and reentrance into international financial markets. The US$ 2.75 billion 100-year bond issue is the crowing of these efforts. The Argentinean bonds will pay around 8 percent per year in dollars for the next hundred years. One may reasonably ask why international financial markets would lend to Argentina, a country that has defaulted between four and seven times before, depending on who you ask. According to the Financial Times it is all a response to the smooth-talking telegenic new president and his market friendly reforms, even though Macri, very much like George W. Bush, was born with a silver foot in his mouth, and the reforms have backfired. In reality the reason for the renewed lending, is that, in spite of its several defaults, the country is a good payer. The very high interest rate implies that even if Argentina eventually defaults, a bondholder can make quite a lot of money. And there is always a chance of selling the bonds in the secondary markets, after making enough back with the high interest rates. Remember that interest rates have been close to zero in international markets, and sometimes negative in real terms, since the last global meltdown in 2008. On top of that, Vulture Funds can always make a buck if Argentina defaults again in the next hundred years. That is their business model. The question you should really ask is why Argentina would borrow again and continue the long cycle of borrowing and defaults. Macri’s development strategy is a throwback to the Washington Consensus of the 1990s. In other words, the Macri administration is pushing for free trade, financial deregulation and a reduced role for the State at home, when these policies have been under attack and in retreat around the globe, more prominently in recent times with Brexit and the election of Donald Trump in the United States. The hope is that increased integration to world markets would bring investment and lead to growth, and that growth in the long run would make it viable for Argentina to repay its debt. The risks are evident. It is unlikely, if not impossible, to think that foreign investment will come and promote growth. The narrow specialization of the Argentinean economy on commodities makes it vulnerable to recurrent crises when prices of its exports collapse. Also, the borrowing in dollars implies that only exports can provide the necessary resources for repaying the increasing foreign debt. This story cannot, and probably will not, end well. The only reason to promote this increase in foreign indebtedness is the short run gain associated to the higher interest rates that these 100-year bonds pay. Not only foreigners, and foreign pension funds will buy these bonds, but also Argentineans. For those that are wealthy enough to hold dollar denominated bonds in their portfolios the very high interest rates, even if risky, imply that Argentinean bonds are a good deal, an oasis of high remuneration in the midst of a financial desert. It is worth remembering, in this context, that it is estimated that wealthy Argentineans hold assets abroad for about the total value of the country’s foreign debt. Macri and his friend are certainly among those that would benefit from his own policies. Also, one should not forget that Macri’s name appears in the Panama Papers, and contrary to what happened in other countries that had politicians implicated, he did not resign after the revelation that he illegally funneled funds to a tax haven. The 100-year bonds are not a sign that the economy is finally doing well, but a brief respite before the coming storm. This paper uses hysteresis to develop the concept of policy lock-in and lock-out. Policy changes may near-irrevocably change the economy’s structure, thereby changing the distribution of wealth, income and power. That may lock-in policy by changing the political equilibrium. Exit costs that block policy reversals also cause lock-in. Conventional thinking treats policy as a dial which is adjusted according to the economy’s state. Policy lock-in questions the dial formulation and raises new issues for optimal policy design. It also offers insights into economic and political crisis theory. Policy lock-in is illustrated with examples that include tax policy, government spending, the euro, globalization, and the neoliberal policy experiment.